Censuses of the Empire have shown consistently that a large percentage of the population is made up of gamers, individuals who enthusiastically and regularly engage in roleplaying games as a social activity. Whether they play such ancient and famed games as Dungeons and Dragons or home-brewed game systems, these individuals enjoy few things more than getting around a table with a group of friends and spending an evening acting the roles of characters, rolling dice, and generally treating reality as just another small inconvenience for an evening. Because such a high proportion of Imperial citizens are gamers, in late 2003, a society was formed to help connect, coordinate, and entertain these citizens. 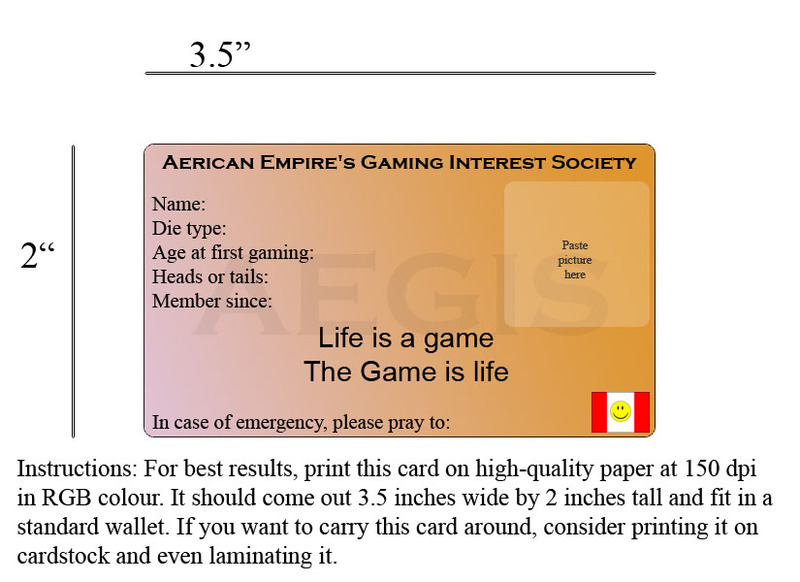 Known variously over the years as the Aerican International Gaming Society, the Aerican Gaming Society, the Imps Gaming Club and the Council of Silinist Gamers, the Aerican Empire's Gaming Interest Society (AEGIS) exists to provide new and different gaming opportunities to citizens of the Empire and any non-citizen who has an interest in such activities. AEGIS works closely with several gaming societies around the world, primarily clubs located at various universities. 2003: Using the Red Dwarf Roleplaying Game system, the storyline When Weasels Attack was held. At the same time, wargaming citizens held games of Warhammer, Warhammer 40K, and various historical games. 2004: Using the D20 Modern rules system, Ghostbusters themed games were run worldwide. Games of Reaper Miniature's Warlord miniature combat game were held at several clubs. 2005: Using various super-hero game system, mostly home-made rules, several storylines were simultaneously run, including Where Walks the Shadowripper and The Doom That Came to Earth. At the same time, various games of Warhammer, Warhammer 40K were held. 2006: Using a combination of various d20 sourcebooks, the long-awaited Existoon! scenario was run by several groups. 2007: In addition to Warhammer games around the world, the Montreal chapter of AEGIS ran its first ever game of The Extraordinary Adventures of Baron Munchausen, a riotous success, and followed it up with a boardgaming night well into the wee hours. 2008: In addition to various miniature games and roleplaying games worldwide, people gathered from far and wide at the Embassy to Everything Else for four hours of The Extraordinary Adventures of Baron Munchausen. The Empire wishes to extend its gratitude to Mongoose Publishing for sponsoring the event. 2009: In addition to several online roleplaying games set up between citizens internationally, the Aerican Embassy to Everything Else once again saw a huge crowd gather for a night of games. The Extraordinary Adventures of Baron Munchausen featured prominently once again, but such games as Apples to Apples and Fluxx also saw extensive use. 2010: The Aerican Embassy to Everything Else was packed on Game Day for a live-action game of Paranoia: High Programmer. A crowd of Imperial citizens turned up in white lab coats, bearing bottles of Bouncy Bubble Beverage and Hot and Cold Fun, and a paranoid, backstabbing time was had by all. 2011: Various roleplaying and story-telling games happened around a centerpiece of Dominant Species, the boardgame where the one who survives is the one most responsive to change. The Empire wishes to extend its gratitude to GMT Games for sponsoring the event. 2012: Game Day 2012 was sponsored by the Discworld Emporium. Discworld-themed activities abounded, centering around an all-day Thud tournament. 2013: Game Day 2013 was sponsored by Game Salute. Alongside a dozen other games, players spent a full day competing to see who could delve deepest into a Colossal Cave, and many hilarious misfortunes befell everyone. 2014: Game Day 2014 was sponsored by AEG. Game Day centered around uncountable rounds of Smash Up and its many hilarious expansions. 2015: Game Day 2015 was sponsored by Greater Than Games. A twelve "issue" Sentinels of the Multiverse tournament was the focus of the convention, with the outcome of each match determining what other games, music, and foods featured alongside it depending on whether the heroes or the villains were victorious. 2016: Game Day 2016 was sponsored by Atlas Games. A massive Beer Money brawl persisted for several hours with combatants dropping in and out in between other games, with the winners taking home accolades, respect, and moderately fabulous prizes. 2017: Game Day 2017 was sponsored by Space Cowboys, who generously provided a copy of their award-winning game, Splendor, and by Czech Games Edition, who donated several digital copies of their games which were given away as prizes. In keeping with the gemstone theme of Splendor, many gemstone-shaped snacks were consumed. A portion of the proceeds of Game Day 2017 were donated to Dans La Rue, a charity operating in Montreal, Canada. 2018: Game Day 2018 was sponsored by TTCombat and Renegade Game Studios. A Rumbleslam tournament ran over the course of the day and lucky players went home with either a brand new team or one of several superstars, while games of Clank! provided accompanying cries of victory and woe. 2019: Game Day 2019 is generously sponsored by Fowers Games. Contact Us for details or to arrange a local participating event! Other activities organized by AEGIS include small gaming conventions for citizens who live near each other, procurement of articles from old gaming magazines, and creation of one-shot storylines, scenarios, and plots for individuals who would like to add to their games either the flavour of the Empire or the sort of humour favoured by citizens. AEGIS has additionally funded the purchase and painting of miniatures with Aerican themes, which are stored in the museum at the Aerican Embassy to Everything Else and procures roleplaying sourcebooks for interested players where possible.